There will be two television programs aiming to promote Cyprus’s culinary culture and world kitchens to familiarize them amongst the youth, with the collaboration of Final International University (FIU) and Bayrak Radyo Televizyon Kurumu (BRTK). One of the programs will be of a cooking show where present recipes from Cyprus and the world kitchen will be presented, and the other program will involve gastronomy students’ where they will display their abilities in cooking in a competition format. Programs will be broadcasted on specific days on BRT1. The programs “Chefs at Final”, will be shot at IFU’s Gastronomy kitchen, famous chefs in the field will give different recipes. 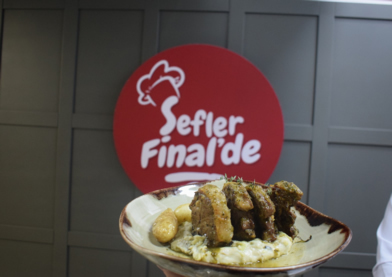 ‘Chefs at Final’, will be broadcasted on Sunday, February 3, 17.00, for the first time on BRT 1 and will be presented with different tastes from Cyprus and International cuisines. The other program that will be broadcasted in cooperation with IFU and BRTK will be a high school food competition called “Young Chefs at Final” with the contributions of The Ministry of Education. In the first stage of the competition, the students of the TRNC vocational high schools who study in the field of Gastronomy will compete among themselves in teams of two. After this stage, the best team selected from each school will compete for the first place in the final competition. At the end of the competition, 100%, 90% and 80% educational scholarship will be award from Final International University will be given to the students who come first, second and third.. The program will be broadcasted once a week from BRT 1, and the final of the competition will be shown live.